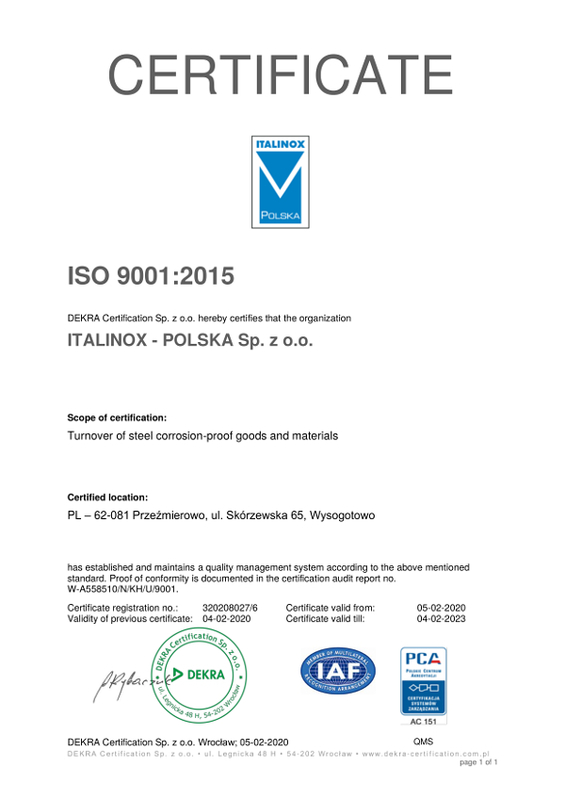 ITALINOX Polska Ltd. sells materials made of non-corrosive steel. It was established in 1995 as another part of the ITALINOX network which has had subsidiaries in Central and Eastern Europe since the early 1990s. What sets us apart from our rival Polish companies is that we offer the widest range of goods available directly from our warehouses, including sheet metal, pipes, fittings, as well as other stainless steel products. Visit us at our new headquarters which was opened in 2003. Its modern warehouse and a business office staffed by highly qualified personnel help us serve our customers more effectively than ever. We guarantee continuous deliveries of materials. Information featured on the website of Italinox-Polska Ltd. consists of freely available descriptions of brands, types and uses of non-corrosive steel, and cannot serve as a basis for reclamation, warranty or compensation claims.